KATHMANDU, Nepal, April 25, 2015 (ENS) – A massive 7.8 magnitude earthquake struck central Nepal today just before noon, local time, turning office towers, monuments and homes into rubble and killing hundreds of people. The quake struck an area between Kathmandu and the city of Pokhara, 77 kilometers (48 miles) northwest of Nepal’s capital Kathmandu. The Home Ministry of Nepal has confirmed 876 people have been killed, other estimates put the death toll at over 1,400, and the number is expected to rise. The government of Nepal has declared a state of emergency covering the affected areas. The number of injured and the loss of properties has yet to be determined, said the Joint Secretary Laxmi Prasad Dhakal of the Home Ministry. Hospital facilities are over-crowded with injured and many injured are undergoing treatment in the open outside the hospitals. 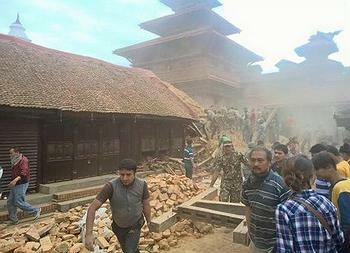 Some 180 bodies have been pulled from the ruins of historic Dharhara tower in the center of Kathmandu. More than two dozen people were also reported killed in neighboring India, China and Bangladesh, Tibet and on Mount Everest, where avalanches were set off. climbers, have been killed in an avalanche triggered by the earthquake. 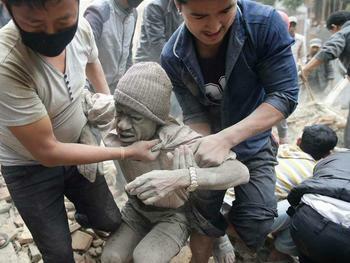 The government of Nepal is requesting international assistance, and help has been offered by countries around the world. “Today’s Earthquake has made us all very sad. Reports are still coming on the extent of the damage,” tweeted Modi. “We are in the process of finding more information and are working to reach out to those affected, both at home & in Nepal,” said another tweet from Modi’s personal account. Modi chaired a high-level meeting of his Cabinet and senior officials today, to review the situation following the earthquake, the first of many planned meetings of the Union Government’s Crisis Management Committee. The Prime Minister directed immediate dispatch of relief and rescue teams, including medical teams and rescuers with dogs, to Nepal, as well as to affected areas in India. He directed that arrangements be made to assist in evacuation of stranded tourists. The Indian Air Force is evacuating 250 persons from Kathmandu today. The Prime Minister was informed that the first set of National Disaster Response Force teams is expected to reach Kathmandu today. Chinese President Xi Jinping Saturday sent a message of condolences to Nepalese President Ram Baran Yadav and expressed China’s willingness to provide all necessary assistance. The United States is sending immediate humanitarian aid and disaster assistance teams and has released an initial $1 million in aid, according to USAID. The United Kingdom is sending in eight humanitarian experts, according to the BBC. Pakistan is sending four C-130 aircraft carrying a 30-bed field hospital and search-and-rescue teams. Norway, Germany, Spain, France, Israel and the European Union have also pledged financial assistance to the government of Nepal. Oxfam and many other aid agencies are requesting donations for earthquake response. “We are preparing to provide emergency help in Nepal following a devastating 7.8 magnitude earthquake. Our team in the country and international technical experts are ready to respond with clean water, sanitation and emergency food,” said Keizer. Frequent natural disasters destroy the livelihoods of many Nepalese. With a population of 26.6 million, Nepal is struggling to give itself a new constitution and a stable government after a decade of civil conflict. Nepal has a GDP per capita of US$1,049, and ranks 157 of 187 countries on the 2011 UN’s Human Development Index. Twenty-five percent of the population lives below the national poverty line on less than US$0.50 per day.